Many Web Retailer members sell on multiple channels – eBay, Amazon, smaller marketplaces, internationally, and on their own sites. It’s pretty much the norm now. Numerous new marketplaces have launched over the ten years that I’ve been running this site. Few have lasted. Even fewer have delivered more than a trickle of sales to the sellers who invested their time in them. But that pattern has been changing more recently. Big-name brands with successful websites like Sears and Tesco have added their own third-party marketplaces. Newcomer Etsy finally bucked the trend for start-up marketplaces, and now drives over $1 billion in annual sales. So I think it’s time to take a fresh look at “alternative” marketplaces, and I’m kicking that off today with an in-depth post about Flubit. They’re a UK marketplace that launched in 2012, with an innovative buyer-driven model. Read on to find out more. In this article I’ll explain what Flubit is all about, including a detailed breakdown of the ordering process. Then I’ll talk about who uses Flubit – the buyers – and how much buying they do, by looking at Flubit’s sales volume and other statistics. I’ll also cover what kind of products sell well on Flubit, and the kind of sellers that they work with. I’ll talk about what’s needed to get started selling on Flubit, fees, customer support and seller support. Finally I’ll give you my opinion on whether it’s really worth selling on Flubit, and let you know what they have planned for the future. What’s so special about Flubit? Most marketplaces follow a traditional shopping model – products are listed publicly for buyers to browse and buy. Flubit doesn’t do that. Instead, buyers copy in product links from Amazon.co.uk (called a “demand”), and Flubit finds them a better price for the same item (called an “offer”). At first glance, it sounds similar to comparison shopping engines like Google Shopping and PriceGrabber. But Flubit is a true multi-seller marketplace: orders are placed directly with the marketplace, and passed on in the background to sellers for shipping. For each buyer demand, Flubit provides only one offer from one seller, even if there are multiple sellers who have that item. It’s similar to Amazon’s Buy Box in highlighting the “best” seller, but goes even further as any other matches are not shown at all. Flubit is very much about beating the price available elsewhere online. It also keeps the amount of effort (for the buyer) comparing and researching down to an absolute minimum. They say 30% of their offers are accepted by buyers, and customers have made an average of 5 purchases each – great statistics for ecommerce conversion and retention. There was a delay of a few hours between making my “demand” and getting an offer back. Seeing just one price and one seller (with great reviews) was a little disconcerting. I’m so used to the noise of eBay and Amazon that it actually seemed too easy. My demand was for a consumer electronics item – a humidifier – so neither a common nor a rare product, and the saving offered was about 10% on a £50 item. I’d recommend trying Flubit as a buyer to help understand how it works. What’s the ordering process from start to finish? The Flubit concept is simple. But it’s very different from the traditional approach, and there are some subtleties, so it’s worth breaking it down step-by-step. When a user places a demand, the Flubit system visits the URL to identify the product and the price it’s available for on Amazon. They search for that item in their database, made up of all their merchants’ individual inventories. If they have the product then an offer is made. Their algorithm generally selects the merchant with the lowest price, but can also take performance into account using factors such as feedback score, delivery time and cancellation rates. The timing of the offer is automated, but – as I experienced – that doesn’t mean it’s immediate. A variable delay is actually built-in, because Flubit’s testing has shown that it improves the conversion rate. When buyers enter a demand they are asked if the product is for a special occasion, and for the gender and age of the recipient. That information is used in the timing of the offer, which is typically four to six hours after the demand is made. The length of time given to accept the offer is up to 24 hours but also variable, again because it improves the conversion rate. If we have that product available with a supplier, the product match and offer is automated through our sophisticated algorithm – this takes into account multiple factors such as stock levels, how in demand that item is, the demographic info the user provided when the joined, the occasion they’re purchasing for, etc. Building in a delay goes against the commonly held belief that online shoppers want instant gratification! So why does it improve conversion? Drawing on Robert Cialdini’s work, my guess is it creates more of a feeling of scarcity if the offer is delayed, in contrast to an immediate offer which might feel like it was in fact readily available, but just hidden away from view. It could also trigger the powerful urge to reciprocate: the delay may (subconsciously) give the impression that someone has worked hard to find a better price for them, and that effort should be paid back with a purchase. What happens if none of the suppliers on board have the item requested? Flubit surprised me again here. They actually have a “demand management and orders” team who manually source the item and create the user an offer. So sometimes the impression that someone worked to find a better price is entirely accurate! Why does Flubit do that? Well, at this stage in their growth, they don’t want buyers to be disappointed. As they sign up more sellers, product coverage will go up and the percentage of manual offers will decrease, but they always expect to have some level of manually sourced orders. The manual process helps Flubit get new loyal buyers, and next time they’ll hopefully demand a product that they do have available. Once a buyer accepts an offer, it is sent to the seller as an order to fulfill. They can process it using their normal order management system, if they use one of Flubit’s integrated tools, or log into the merchant area (known as WeFlubit) to pick up the order, print packing slips etc. Sellers are paid at the end of the month via direct bank transfer, although it can be changed to a fortnightly or weekly cycle if needed. From a seller’s point of view, the process might sound quite laborious and disconnected – the buyer puts in a request, gets an offer hours later, thinks about it for a while, and finally accepts it, or maybe just lets it expire. But it’s effective, and the best part is the seller only hears from Flubit when the buyer accepts the offer. It’s possible that the product could go out of stock in between the offer being made and accepted, but that’s Flubit’s problem rather than the seller’s. They will try to find an alternative supplier, or compensate the buyer with loyalty points if they don’t succeed. Overselling is a common customer service nightmare for multichannel sellers, but if stock levels are accurate it shouldn’t happen with Flubit. Who buys using Flubit, and why do they use it? Flubit buyers are driven more by price than speed of purchase. It does seem effective at finding better prices, at least in some categories, so buyers who like the service and remain price-conscious tend to come back to save money again. Their customer base is varied but they have a large number of parents, students, gamers and techies using them for video games, computing, toys, DVDs and books. Flubit also has a loyalty system, and the points can now be used to expedite demands, so regular buyers don’t have to go elsewhere if they need to purchase more quickly on the odd occasion. Flubit only accepts UK addresses, but do have some international customers using parcel forwarding services. What is their sales volume? There isn’t a lot of hard data on Flubit’s GMV, but it’s been reported that they processed over £2.5m of sales in 2013. We get over 200,000 visitors a month to the site, and a lot of repeat customers coming back to demand and order. We get thousands of demands a day, which is growing 30% month on month. The products sold via Flubit.com are provided by over 300 independent online retailers selling relevant, in demand products. To build awareness, Flubit runs advertising campaigns on digital displays, social media and trains, which have increased visits, demands and orders. I think building a successful online marketplace is a chicken-and-egg problem. Buyers won’t come unless there are plenty of products available, at competitive prices. Sellers won’t come unless there are plenty of buyers already using the site. The upside of this dilemma is that if a marketplace can overcome the initial inertia, it starts working in their favour instead. Sellers join because there are buyers, the product range improves, more buyers become interested, and so on. Has Flubit reached that point? I really don’t know. But I think they have the potential, at least. Unlike many marketplaces taking a me-too approach, they have a unique model – which is crucial if they are to capture buyers’ attention. The use of manual sourcing to fill gaps in product coverage is surely costly, but a clever way to keep buyers on-side. And they have a good range of integrations with marketplace management software to make it easy for sellers to get on-board. They’re better positioned to succeed then most, in my opinion. What sort of products sell well on Flubit? Product categories that sell well include books, toys, video games, consumer electronics and computing goods. Flubit has run marketing campaigns targeting books, toys and video games which have boosted orders for those product categories. They’re looking into new categories for next year, such as home and garden. Buyers are more likely to demand popular products, but sellers aren’t restricted from selling other items. They can provide their entire inventory, including uncommon items and discontinued models in the data they provide. Used items are not sold on Flubit, and products do need to have a recognized product code such as a UPC or EAN. Flubit’s blog posts about products in demand are a good source of information on popular items. Alongside a good range of popular products, price is a very important factor. But because Flubit takes a different approach to fees (more on that below) beating your own Amazon price doesn’t mean you will make less money selling on Flubit than on Amazon. We ask for the most competitive price that they can do. That’s the whole business model. We ask for that so that we can sell the product to our buyers for less than it’s being marketed for on Amazon. What kind of sellers does Flubit work with? Currently, Flubit only works with reputable UK-based online retailers. The typical Flubit seller is a small to medium size UK business, with a large number of product lines (SKU count), including some high-demand consumer products. They’re not well known to consumers, on the whole, and make most of their sales through marketplaces. Some also sell through their own websites. Marketplace ratings: do they have a good reputation on sites where they already sell? Feedback on review sites: do they have good reviews on any third-party sites? Product relevancy: do they sell products in Flubit’s strongest categories? With only a few hundred sellers at present, Flubit is not as competitive between its sellers as the major marketplaces. But as a price-beating service, sellers are still competing with the advertised price on Amazon. Sellers can expect some competition on Flubit for very popular branded products. Offers will generally be made from the merchant with the lowest price, but they do take into account performance factors such as feedback score, delivery time and cancellation rates. All of that will be quite familiar with Amazon’s Buy Box and eBay’s search algorithm. What’s involved to start selling on Flubit? As a private marketplace where products aren’t “listed” in the traditional sense, getting started on Flubit is relatively straightforward. In terms of the data they need, it’s much closer to selling on Amazon than on eBay. After registering, and being approved, Flubit needs access to inventory data including prices and stock levels. They have an impressive list of ecommerce software with Flubit support built-in, plus custom integration options of API, files or feeds. They also have a “Merchant Integrations” team who help sellers get on board. Marketplace management tools in the Web Retailer directory with Flubit support built-in include: Brightpearl, ChannelAdvisor Marketplaces, ChannelGrabber, Volo, Faab Multi Channel, Lengow, Linnworks, Plentymarkets, SellerExpress, Seller Dynamics, StoreFeeder, and XSellco. Ecommerce platforms (shopping carts) in the Web Retailer directory with Flubit support are Bigcommerce, ekmPowershop, Shopify and Volusion. A full list of integrations is on the WeFlubit site. Flubit charges no fees or commissions. Well, in a sense. Sellers get exactly the price they ask for, and buyers pay exactly the price they are offered. But those are not the same price. While sellers set their own prices, the buyer’s price is determined by Flubit. The difference between the two is how they make their money. In a way it’s like the buy-sell “spread” when trading stocks and shares, but less transparent. Much as sellers dislike fees, I think it’s reassuring that Flubit takes a cut of sales. I’ve seen marketplaces with no fees, or extremely low fees, and not surprisingly they struggle to stay in business. They certainly can’t afford to advertise, and no advertising generally means very few buyers. Flubit calls the seller’s price the Flubit Base Price. Because it’s a price-beating marketplace, it needs to be lower than the price on Amazon. One common formula is to set it to the Amazon price less Amazon fees, so the seller makes the same net profit as they do on Amazon. Flubit’s commission on top is relatively low, leaving room for the buyer to save money. So beating your Amazon price, even when it’s the best price on Amazon, is not a tall order. Instead of charging a % commission like Amazon, we ask our seller for their most competitive price and sell it to the user for that, plus our variable margin. For example, if a seller is selling a camera for £100 on Amazon, and paying a 20% commission to Amazon, they are only making £80. We ask them to sell that camera through Flubit for £80, and we might sell it to the consumer for £85. The merchant gets a sale, the user gets 15% discount and we get 5%. What do sellers have to do to support customers? On Flubit, buyers can see which seller is fulfilling their order. If they have any issues with the order they can raise a support ticket via Flubit, and the message will go directly to the supplier to answer. So sellers do have to be responsive and professional, which is to be expected. Flubit doesn’t have a sophisticated and transparent seller performance system comparable to eBay or Amazon, but do take factors such as feedback score, delivery time and cancellation rates into account when making offers. Clearly sellers should follow all the same good practices expected of them from the major marketplaces to keep Flubit customers satisfied too. 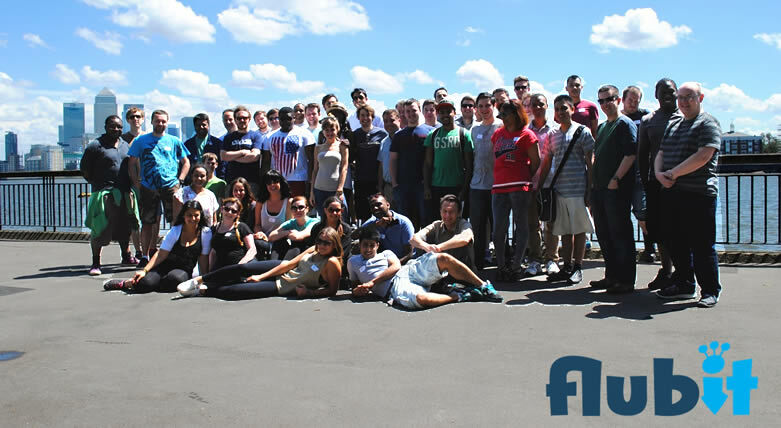 Flubit also has its own customer service team, and will step in themselves if necessary. How does Flubit support sellers? Merchants have access to the WeFlubit seller area where they can access orders and detailed information on their performance. 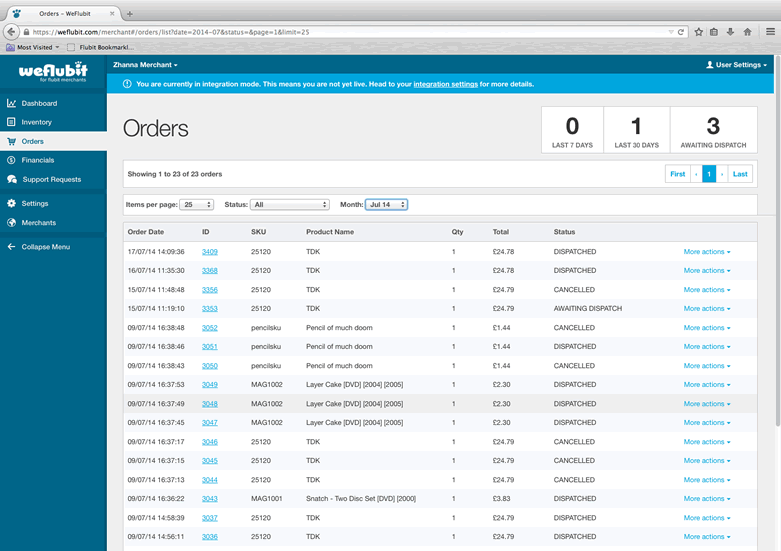 The screen shots below show the settings and orders pages (for a demo account). Flubit will soon be announcing the launch of a new “Merchant Accounts & Development Department”, whose job it will be to help merchants increase sales on Flubit and their partner sites. New features in development will allow merchants to see offers that have not yet been accepted, and to report on “missed opportunities” – sales they have narrowly missed out on. Missed opportunities will illustrate how price changes would affect sales, showing (for example) when a relatively small lowering of price could result in much higher sales. Flubit are not yet at the scale where seller protection and dispute resolution are a major factor, as they are on eBay and Amazon. Is it really worth selling on Flubit? This is the million-dollar question, and although I can’t tell you the answer I can give you some pointers. I hope it’s helpful. Flubit has two case studies on their site at present. The businesses covered are Speedy Hen and The Game Collection, and both are media sellers. Speedy Hen have made approximately £40,000 in sales on Flubit since signing up in April 2013, with a very large product range of 660,000 SKUs. The case study of The Game Collection doesn’t include sales data, but they say “it’s providing a valuable stream of orders”. I spoke to two of Flubit’s software partners to get an opinion from a slightly different angle. This is what they told me. StoreFeeder clients have been selling on Flubit’s platform for a few months and seen good levels of success. We’ve had great feedback from sellers, one client said, “we are seeing orders that we’d have missed out on via traditional comparison shopping by adopting this new channel and it’s methodology”, a sentiment echoed by many. Flubit is starting to grab the attention of our multichannel sellers – it’s certainly a new channel of sales to explore for them and we have made it relatively simple to list products. Because it’s in its infancy, many sellers have taken a “wait and see” approach and time will tell how much traction it will gain. But because it’s simple to list your stock, we’re actively encouraging users to add their inventory to the marketplace to see if sales are positive. Are you a UK business selling popular books, toys, video games, consumer electronics or computing goods? Are you trading on Amazon.co.uk, competing on price, winning the Buy Box frequently, and doing a good volume of sales overall? 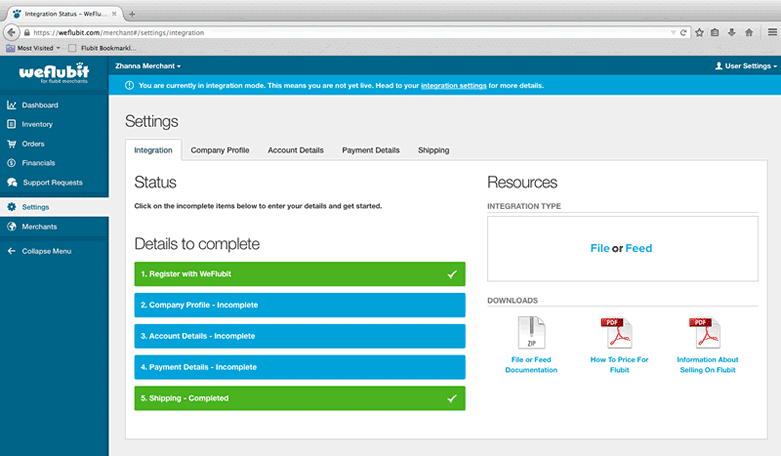 Are you already using one of Flubit’s integrated marketplace management tools? Does your marketplace management software make it easy to set a competitive “Flubit Base Price” for your products, for example by creating a simple pricing rule based on your Amazon price? If you can answer “yes” to all those questions, it should be so quick to start selling on Flubit that even a fairly low volume of sales will pay off. It’s almost a no-brainer for sellers in that situation. If you can answer “yes” to questions 3 and 4 the effort required to start on Flubit should still be low, but your chances of success may not be quite as good. It may well be worth trying. An interesting case is sellers who are narrowly missing the Buy Box on Amazon. (They should probably look into repricing software, but that’s another topic.) Flubit offers them an interesting opportunity to undercut their Amazon competition without directly beating them on price – as long as their competitors aren’t on Flubit too! For everyone else, it’s going to take more time and effort to get started as a Flubit seller. Will that pay off in sales? There’s no sure way of knowing, and only one way to find out: to just do it. Only you can decide if they are worth investing your time in as a seller. What have Flubit got planned? Flubit was initially open to any URL, so users could demand anything from anywhere online. They went Amazon-only in 2012 to help manage the order volume and maintain service levels. Now, they are once again rolling out a number of additional source URLs, including Rakuten, Argos, eBuyer, John Lewis and Tesco Direct. Flubit plans to grow their user base and the number of merchants on board, continue enhancing their technology, develop more partnerships, and then expanding overseas. International expansion would be big news, with no similar service doing well overseas. Flubit’s UK sellers would also be positioned well to sell across borders to other Flubit markets, if that will be a possibility. This is the big one on the immediate horizon. Flubit has a partnership with Barclays on their bespoke offers platform. It’s a Groupon-style site with daily deals in travel, jewellery, leisure, electronics and more. Although its not the best known site of it’s type, it’s a Barclays service and they can promote it directly to the UK’s 35 million Barclaycard holders. With the right kind of marketing effort from Barclays, Flubit’s volumes could soar. The partnership will put a price-beating feature on the bespoke offers website. A launch date has not been announced, but it is expected to go live soon. Flubit sellers don’t have to do anything themselves to sell on partner sites like bespoke offers. As Flubit merchants, they automatically receive orders from partner sites in just the same way as Flubit orders. Compared to the traditional marketplace model, Flubit really does seem to do everything backwards. There are no listings or public prices – buyers have to say what they want. Then they have to wait for to find out what the price will be, and the transaction is done in private. Sellers set the price they want and, unlike other marketplaces, are paid exactly that. The buyer’s price is not all that relevant to them. But they’re not being different for the sake of it. All that upside-down logic holds together perfectly as a compelling price-beating service for money-saving shoppers. There’s a lot of them out there. As more and more discover that Flubit is a genuine and reliable service, it’s growth will accelerate. That’s the plan anyway. If it works out, being on board as a Flubit seller will be one hell of a ride. FaabMultiChannel.com was one of the 1st system integrators to integrate and offer Flubit for FREE to any merchants wanting to sell on Flubit. It is a new channel and some of the merchants are playing a waiting game. However due to its simplicity and ease of use, we are requesting merchants to list their products. If any merchants want to sell on Flubit, they can use http://www.FaabMultiChannel.com for completely FREE. No charge or restrictions. Never heard about this new marketplace and may look into this territory. As for the integration, why there is no big e-commerce shopping cart name, such as zen-cart, magento?